Terribly Interesting: This Floors Me. Well, y'all, here we are. I have been carefully removing the paint from those windows. In every crack, cranny, and crevice. Whew. They are big. The other ones in the room were big. The moulding is big. Who thought of all this wood? Well, I am enamored with it and I am in my last little bit of stripping the paint off. It's quite the tedious process in order to protect the old wood. Some of the panes of glass were actually being held in by the old paint. Some re-caulking was in order. As you can see, my man started putting house wrap up. Next we will foam the walls and drywall them. 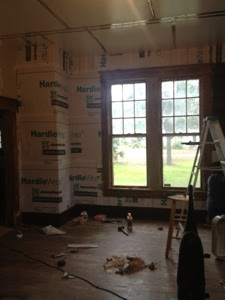 Then put up a beadboard ceiling and mould it out. I have begun staining the floor. It's blowing my mind. It's 99 years of gorgeous character. I am choosing to do it all by hand so we can keep all of the little bits of "charm" that have occurred over the years. I wanted to sand it, but keep the aged spaces and all of the little scratches and divots. Oh my word. This girl is pretty. You'll have to live in suspense. I'll post a picture next week. Next Thursday I will be speaking at MOPS in Brownwood. If you think of it, say a little prayer for me. Don't miss our fish fry on October 12th.